"It's grandma's chocolate pie that's good to the last piece. Serve with whipped cream, if desired." In a large bowl, combine sugar, cocoa and melted butter. Beat until smooth. Beat in eggs, milk and vanilla. Pour filling into pie shells. Bake in the preheated oven for 35 to 40 minutes, or until golden brown and filling is set. 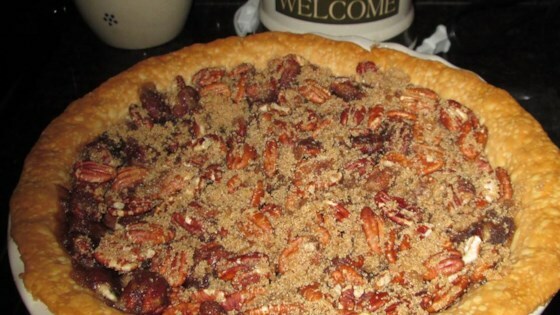 This pie was as easy to prepare as promised, but the texture after baking was disappointing. Luckily, my husband is a huge fan of chocolate pie in general, so it wasn't a total bust! This recipie made the best pie I have ever had! It was so simple! After I baked it I was a little unsure by the way it looked, but it was awsome!!! I cant wait to make it again. Really good chocolate pie, but my Grandma always added 2 tbs of cornmeal to hers. Also this recipe didn't make enough for two pies I had to double the recipe. Other than that really good pie. You can also take the unbaked pie crusts and place into a small casserole dish to be able to cut the pie into easy-to-serve squares! Great recipe!! My 14 year old daughter made this for her end of the school year party. Everyone loved it & it was very easy for her to make all by herself!! Thanks for the recipe!